When I first told my husband about the idea for writing a book about employee development OUTSIDE the classroom and outside 'the box', he responded, “You mean, you’re going to write yourself out of a job?” Why would someone who makes her living through facilitating learning (aka 'Training'), often within a classroom or a formal learning program, try to help supervisors, HR and training professionals, and employees find ways to develop skills outside the classroom and without her help? Well, I don’t think Employee Development on a Shoestring will put the training industry out of business. Far from it. I wrote this book because I am passionate about learning and development. I wrote this book because I am passionate about supporting leaders in their efforts to become more effective. And I wrote this book because often, training is simply not the answer. It is estimated that 70 percent of all leadership development takes place via on-the-job experiences rather than formal learning events. The “70-20-10 rule,” as this idea has become known, says that development happens in three ways: 70 percent on-the-job experience, 20 percent through relationships and feedback, and 10 percent from formal training opportunities. All over the world, supervisors and professionals like you are faced with a challenging task of helping their staff members grow and develop within limited budgets and timelines and ever-increasing pressures to perform more with less. Supervisors and employees desperately need alternatives and complements to the usual approach, because it is not enough. And so many of you are so overwhelmed with a growing workload that you simply don’t have the time or the requisite knowledge to come up with creative ideas for developing skills within the parameters that are presented to you. Well, this book is here to help. You don’t have to spend any time searching for ideas, because they’re right here in this book. You don’t have to spend time thinking up possible obstacles to each method—I’ve done that for you. And you don’t have to spend lots of time designing implementation plans because I’ve created the tools and supports that can help you quickly ensure that your employee development methods are successful and sustainable. Who Can Benefit From Reading This Book? 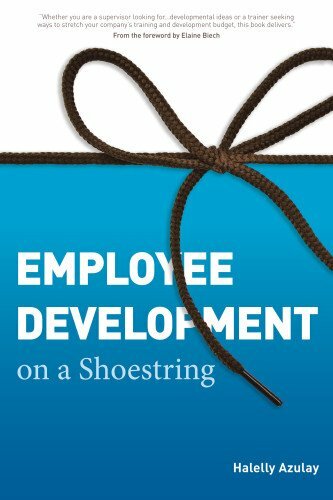 Employee Development on a Shoestring is written primarily to address the needs of those in a position to help employees develop in their current jobs. Whether you are a supervisor, a manager, a director, or an executive, a key part of your role (“Job 1” as Elaine Biech puts it in her foreword to the book) is to ensure that employees are growing and learning. If you are a talent management, human resource, personnel, talent development, training, organization development, or workplace learning professional, your job is to ensure that supervisors throughout your organization are tending to this “Job 1.” Perhaps you are a mentor or career counselor or coach, and you are using this book to help your protégé or client make career development plans. And if you are a self-motivated, self-starting employee, you may enjoy reading this book to get ideas about how to take your development into your own hands rather than waiting for others to suggest strategies to you. Anyone who wants to ensure that employees are developing new skills and knowledge and who realizes that sending them to a training class cannot be, and should not be, the only path to achieve that outcome, should read and benefit from the ideas presented in this book.